On the door of Jim Dixon’s office, there’s an image of a yin-yang symbol, two opposites joined together in the shape of a circle. It’s an image we’ve seen hundreds of times but something about this one makes it unique. “It’s two red blood cells,” says Jim. “It’s an image I took from our electron microscope.” It was the first time he’d ever seen two blood cells joined like that so he captured the image to show his colleagues. Jim is the Assistant Chief Medical Technologist in the Pathology department at the Montreal Children’s Hospital (MCH), a role he’s held for more than six years. Earlier in his career, Jim worked as a marine biologist after graduating from Mount Allison University in New Brunswick but his interests eventually led him to Dawson College where he studied Medical Technology. After Dawson, he started in Pathology at the Montreal Neurological Hospital (MNH), where he worked for 14 years before coming to the Children’s. About half of Jim’s time is dedicated to administration duties in the department. The other half involves electron microscopy, or EM, a very specialized area in pathology that the department uses in about 10 percent of the cases they see. There is no formal education for EM—Jim started learning it at the MNH and estimates it took about five years to gain his expertise. Over time, he’s become part of a wider group of people working in this area. “It’s a small field, but we have a strong network across many countries and we often consult with each other,” he says. 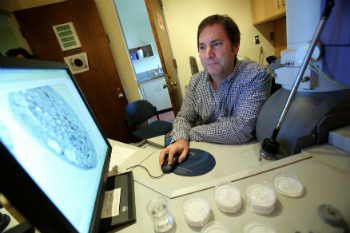 The MCH Foundation provided funding to purchase the hospital’s electron microscope, which is the only one at the McGill University Health Centre (MUHC). The MCH is the referral centre for electron microscopy at the MUHC and also does work for the Lakeshore General Hospital and St. Mary’s Hospital Center.